In contrast with the traditional spring commencement ceremonies that have taken place in the Big House, hosted tens of thousands of people, and featured such guest speakers as Bill Clinton, Sanjay Gupta, and Barack Obama, this year’s winter commencement will likely reach a peak level of excitement when overachieving LSA senior Hannah Tremain describes at length how the graduating class of December 2014 is just as key to the world’s future as glucose is to photosynthetic organisms. 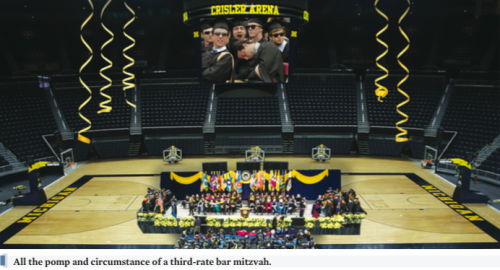 Sources report that the student speaker’s ramblings linking education, friendship, and the rough endoplasmic reticulum of the common dogwood tree cell will no doubt shine like a diamond in comparison with the faded maize and blue streamers purchased from Party City that will adorn the Chrisler arena, the middle school band hired to play ‘Hail to the Victors,’ and the headlining speech by washed-up astronaut Charles F. Bolden Jr, who hasn’t even left the earth’s lithosphere. Tremain’s speech is sure not only to earn praise from the administration, but also from students.